The BOOSTXL-CAPKEYPAD is an easy-to-use evaluation module (EVM) for the MSP430FR2522 capacitive touch sensing microcontroller (MCU) with CapTIvate technology. The BOOSTXL-CAPKEYPAD can be used in three different ways - with a LaunchPad development kit, with the CapTIvate development kit (MSP-CAPT-FR2633) or with the CapTIvate programmer board (CAPTIVATE-PGMR). The BOOSTXL-CAPKEYPAD enables you to extend your LaunchPad development kit design by adding a 12-key capacitive touch numeric keypad with LED backlighting and proximity wake-up. Don’t have a LaunchPad kit? The BOOSTXL-CAPKEYPAD may be used as a simple CapTIvate technology evaluation module when coupled with the CAPTIVATE-PGMR for interfacing to a host PC running the CapTIvate Design Center. It is even possible to bypass the onboard keypad and connect up to three external capacitive sensors to the BOOSTXL-CAPKEYPAD to test out your own sensor design concepts. 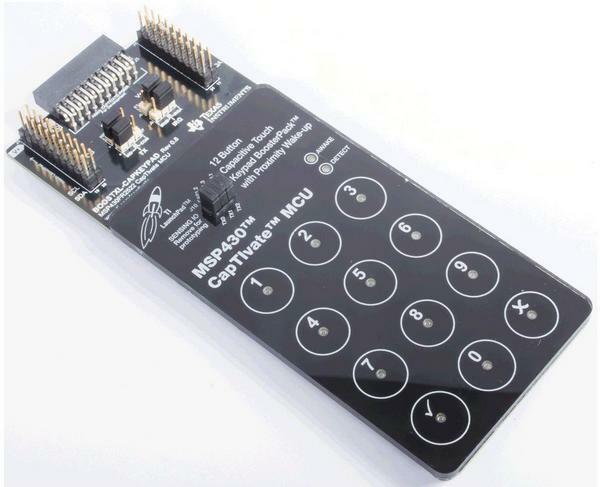 If you have a CapTIvate development kit (MSP-CAPT-FR2633) you can use the programmer board that is part of the kit to evaluate the BOOSTXL-CAPKEYPAD.